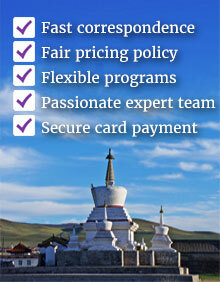 PREMIUM TRAVEL SERVICES is a fully certified Ulaanbaatar based company run by a team of passionate Mongolian travel experts with experiences over a decade in travel and tourism industry. At Premium Travel Services, we specialise in inbound tour operator, tourism trainings & consultancy as well as outbound business travel services. We are a proud member of PATA (Pacific Asia Travel Association), MTA (Mongolian Tourism Association) and ATTA (Adventure Travel Trade Association), and aim to bring in the best standards in what we do. PREMIUM TRAVEL: is a specialist tour operator offering experiential journeys and tailor-made holiday tours for small, private groups of international travellers. We strive to deliver the highest quality travel services in Mongolia, creating a unique tour itinerary for you, and further making your Mongolia holiday a lifetime experience. You, as our Customer, can be confident that Premium Travel will organise your tour efficiently and will be there at your service throughout your Mongolia holiday. PREMIUM TRAINING AND CONSULTANCY: We have set our ambitions to make an excessive difference in Mongolia’s current services quality in tourism supply chain. We work with tourist camps, niche service providers, NGOs assisting business development, new market entry, trade fairs participation and career counseling. Also we are happy to work with existing businesses to channel their business growth.